From La Paz we took the bus two hours towards the Peruvian border, through largely mountainous countryside. 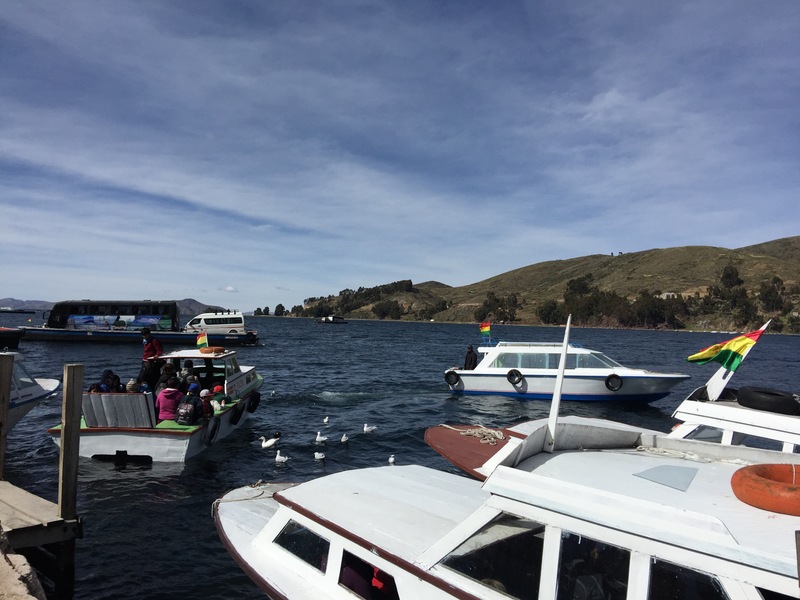 We soon reached the Bolivian shores of Lake Titicaca and needed to disembark from the bus, in order to get a ferry across a small a narrow section of lake. 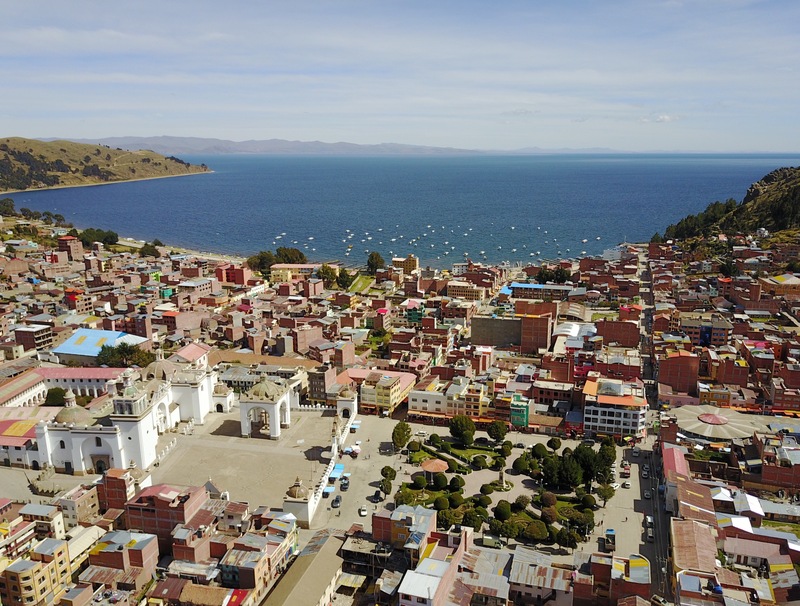 At 4,200 Lake Titicaca is higher than La Paz, so the air was again thin. Whilst we boarded a small rickety motorboat, even more concerning was watching our large bus (with our luggage) boarding what was essentially a raft. Remarkably both boats made it to the other side and we made our way to the lively town of Copocabana. 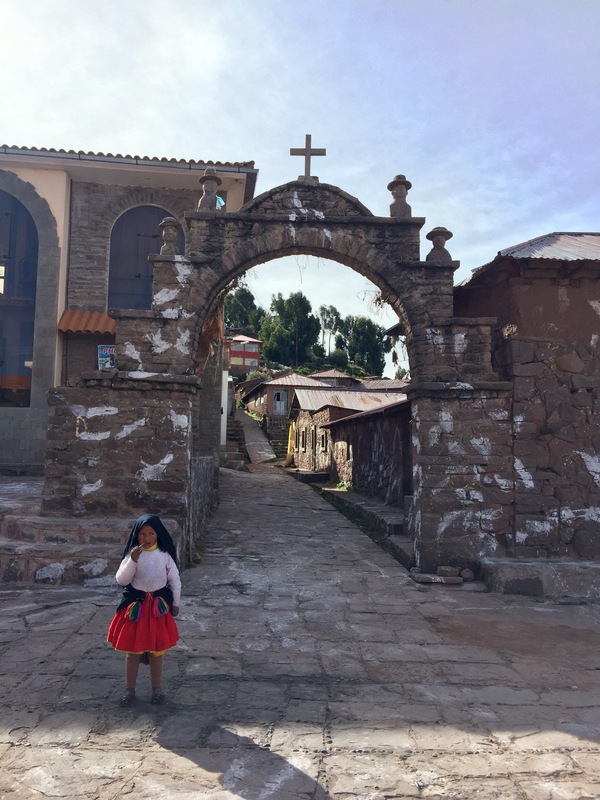 The town is apparently a major holiday resort for locals and a popular stopover for Backpackers crossing between Bolivia and Peru. Whilst most of the group hung around the main tourist street to eat, we ventured into the central plaza and took photos of a beautiful basilica. We eventually found a small coffee shop, but the American owner popped out to say they weren’t opening until tomorrow but could make us a pizza if we wanted. Never saying no to pizza we took her up on the offer, although being home made it took a while so we had to get it boxed and eat it on the run. When we got back to the group we discovered the bus to the border wasn’t leaving for another 30mins – so no rush after all. 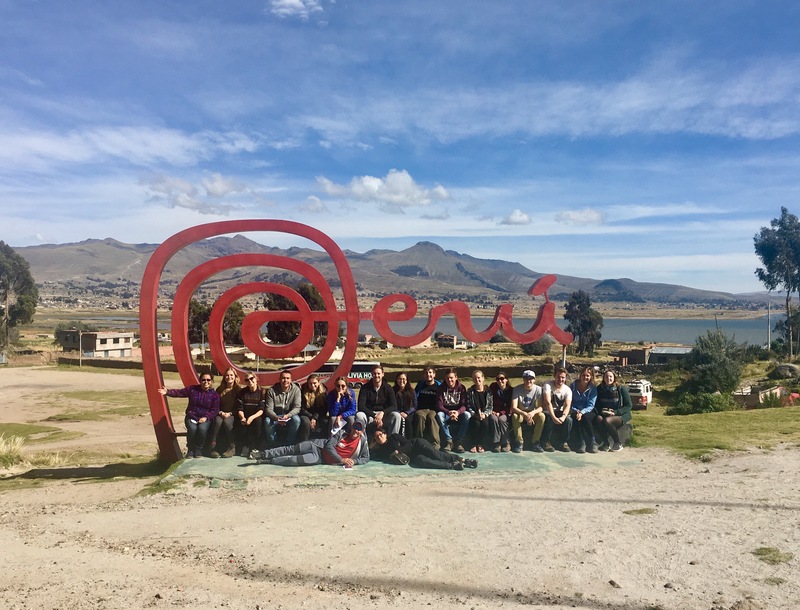 After a relatively hassle free border crossing, we changed up our Bolivianos for Peruvian Soles and with passports stamps boarded the bus for Puno. At first glance there wasn’t much to the town, like Copacabana it appeared a bit of a party town. We got our rooms and importantly some Wifi to check on the UK election results. 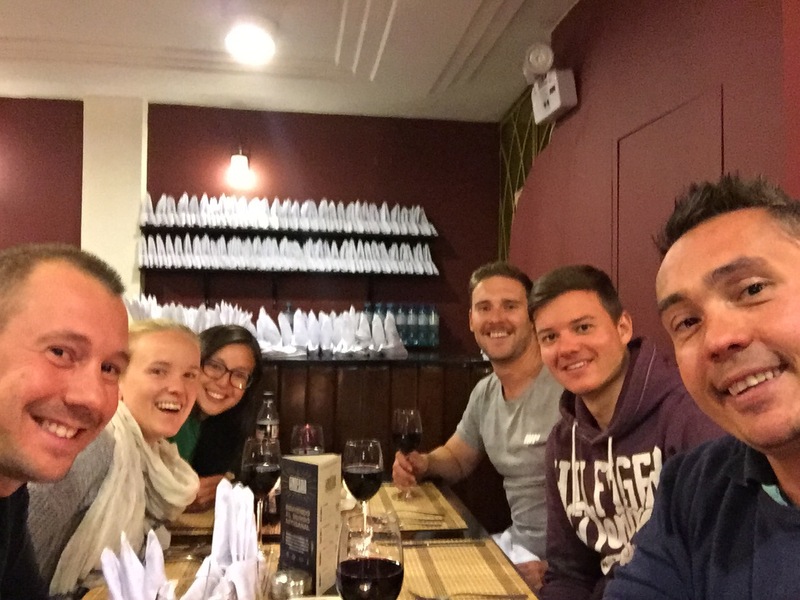 While the initial plan was for a group meal, we decided instead on a treat – a couples night with Jen and James, Marc and Marie at the best restaurant in Puno. We all avoided the Guinea Pig main, opting instead for the beef and dauphinois and a delicious selection of starters and deserts, washed down with a great local red wine – all for S$80 (£20) each. After a thoroughly pleasant evening with our new friends, we headed home and caught the end of the election results. It was gone midnight in Puno so we headed to bed, knowing we had an early start. Breakfast was awful, as with almost every hotel we’ve stayed at in South America. We were able to leave our backpacks and just take our day bags – so with our lighter than usual loads we climbed into a rickshaw, headed for the port. We somehow picked the party rickshaw, with dance tunes blaring and plenty of bling, we had an awesome ride down to the ferry – we tipped our little driver who’d had to cart 190kg all that distance. Our first activity was a food shop for our host families at our homestay. Essentials included cooking oil, rice, pasta, sugar, flour and canned goods. Shopping completed we boarded our longboat style ferry bound for the famous floating islands. 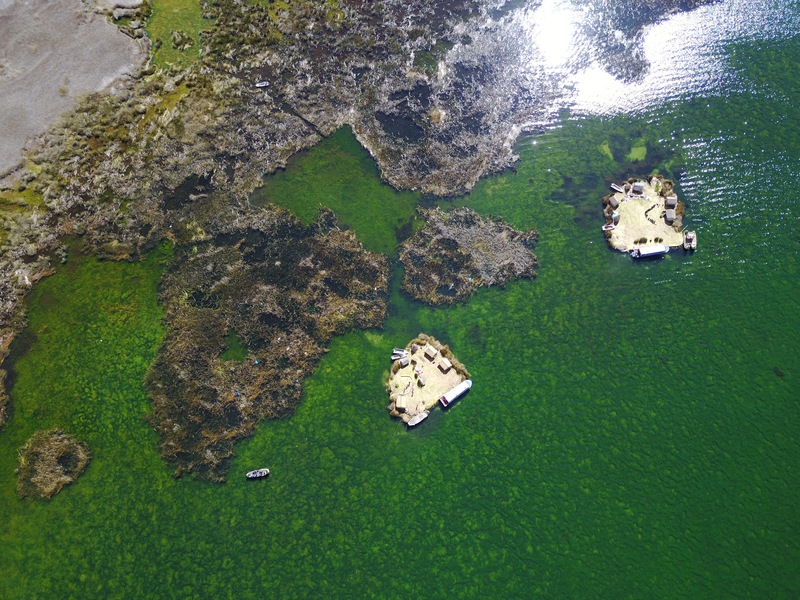 There are around 150 floating islands on Lake Titicaca, each home to a couple of families. It’s believed their ancestors took to leaving on these man-made islands to escape the Spanish invaders. The islands are built in shallow 2-3m deep water, using the local reeds which have a hollow fibrous texture which makes them float. Peat is used as a roughly 6mx6m foundation, followed by layer after layer of reed, which is stacked to provide a stable but springy landed. The communities survive by fishing, hunting ducks and increasingly tourism – welcoming visitors and selling beautiful local wares. Whilst most of the group opted for a ride on a traditional reed raft boat, Mike flew the drone – much to the amazement of the a young boy on the island. Once everyone was back on ‘dry land’ we browsed the hand woven throws and pillow cases and opted for a beautiful black and orange tapestry of Pachu Mama. From the floating islands we headed by boat to a large, home to nearly 4,000 people. Our first challenge was an oxygen sapping 30 minute walk up a steep hill. Thankfully, rather than exploring, we headed straight to lunch, giving us a chance to catch our breath and refuel. During a lunch of potato soup and fresh trout, we were given a talk about the local dress and customs – beautifully acted out by Emma-Kate and Seb. After lunch we had a pleasant stroll back down the hill to the main square, for some photos, before descending to the harbour and boarding the ferry to our homestay. The drone shot is very nice. That’s funny that you picked the party rickshaw.